Easter (Pasqua in Italian) is a magical time to visit any part of Italy. In 2019, Easter will be celebrated on Sunday, April 21st. The Easter season is filled with food (yes, even Easter eggs have made their way here), family and religious rituals. But there’s something very special about spending Easter in Rome, with the Vatican taking center stage in the festivities. Holy Thursday: On the morning of Giovedi Santo, Pope Francis blesses the holy oils during a special mass in St. Peter’s Basilica. In the evening, it is tradition that the Pope holds another mass and during the liturgy he washes the feet of 12 priests in imitation of Jesus during the last supper. Pope Francis, though is one for breaking tradition, and he is planning to visit a center for those with disabilities to wash the feet of many of the residents. Good Friday: In observance of the suffering of Jesus, the Vatican does not hold a mass today but does hold a celebration of the lord’s passion at 5 p.m. in St. Peter’s Basilica. 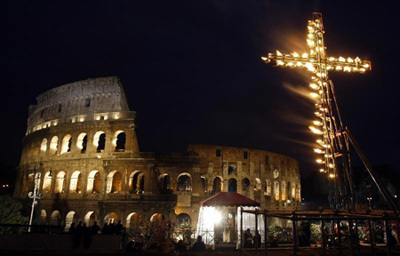 Later in the evening, Pope Francis will lead the stations of the cross at the Colosseum. This stunning and solemn tradition began in the 18th century in honor of Christians were martyred at the Colosseum in ancient times. Throughout Italy, Good Friday processions are held in the streets of local communities, sometimes with thousands of participants honoring statues of Jesus and the Virgin Mary. Holy Saturday: Pope Francis celebrates evening mass at St. Peter’s Basilica. Traditionally, at this mass, adults who have converted to Catholicism are accepted into the Church. Easter Sunday: Pope Francis will celebrate Easter Mass in St. Peter’s Square. At noon, the Pope gives his annual “Urbi e Orbi” blessing from the Papal window. Thousands of people are expected to jam in the square for these special events. Those who want a more low-key experience can attend mass in any of Rome’s 900+ other churches. After mass, Italians across the country celebrate with a feast of lamb, spring vegetables (like asparagus) and the traditional Easter pie, made with ricotta cheese. And of course there are sweets – hollow chocolate Easter eggs and sweet bread with Easter eggs baked inside. Little Easter: The Monday after Easter, known as Little Easter or La Pasquetta, is a holiday in Italy. For Romans, it is can be a day to escape into the countryside with a picnic of Easter leftovers or a chance to eat out at a favorite restaurant.